Welcome to Post-weekend Poetry and the sixty-seventh poem in this series. This week’s piece is by multi-genre author Nigel Hey. A book against your knee. Of your flight from me. It still affects me to read this short poem because that is exactly how I felt at the time, as I looked in on Jonathan to say goodnight. I feel that way still today, fifteen years later, as I remember and re-live the moment. It was delightful. Thank you, Nigel. 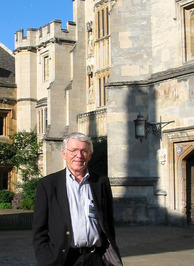 Much of Nigel Hey’s career, since moving to New Mexico in 1965, has been associated with science writing, the rest with other enterprises that we tend to lump together as various parts of “the media.” His personal life includes some quite different subject material – living twin lives as an Englishman and an American; being always enticed by adventure and travel; cultivating a spiritual and philosophical life; bringing up a family; friendships with Native American people; and living since infancy with chronic asthma. When people ask him why he decided to be a journalist, or a writer, he replies simply that it is because he is curious, and that being more specific would tie him down to a relatively narrow field. 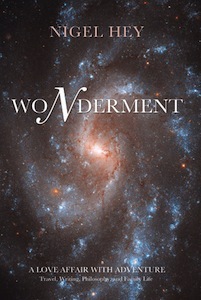 Writing, he says, and the observation and research that supports it, satisfies his curiosity while never failing to fill him with even more wonder. Most recently he was a science writer, national media chief, and consultant for Sandia National Laboratories in New Mexico. At other times he served as a reporter on the Kentish Express, editor of the Bermuda News Pictorial, and editorial director of the London-based publications arm of IMS International (now Dun & Bradstreet’s IMS Health). A really great poem! I loved it!